Tiring of the blandness of empires in the VBAM Campaign System? Not any more! The Menagerie provides a custom race design system that allows players to create their own, unique empires, selecting from a combination of over one hundred racial traits and nearly a dozen government types. The number of trait/government combination make it so that no two empires are exactly alike. In addition to the custom race design system, The Menagerie also includes a group of thirteen sample custom races. Each of these pre-generated races comes with its own force list, which is compatible with those found in the VBAM Campaign Guide! Yes, that means you can play with these races "right out of the box" with no additional setup required. A random race generator is also included, which will allow CMs to quickly and easily generate new custom races on the fly -- perfect for those playing in Exploration campaigns with NPEs! SPECIAL BONUS! 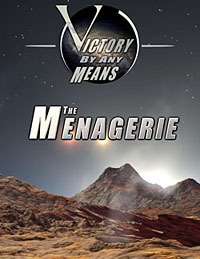 - As a special bonus, The Menagerie electronic release is accompanied with a 20-page bonus supplement that provides "Lost Traits" (four that we pulled for lack of space), and sample custom races for the races from the VBAM Campaign Guide, The Wars of the Boltians and Kuissians, and The Escalation Wars: Empire Rising. This content is not included in the print version of the book! Michael Inkmann 6 5 5 I paid half price. i was hoping to fain ideas for a Marvel Heroic rpg alien race. It gave me some ideas but because I don't own the VBAM campaign book it has very limited value.